Continuing on in my Darth Maul exploration project, while Darth Maul, himself, does not appear in season three of Star Wars: The Clone Wars, there are many references to him. Darth Maul is not a unique creature – there are not only more of his species, there are more in his bloodline. The males who live on the far side of Dathomir are the counterparts to the Night Sisters. Both Count Dooku and Mother Talzin are familiar with Darth Maul having fought for the Sith. Obi-Wan Kenobi initially thinks that this is Darth Maul, because this is the only time he has ever come into contact with one of this species. Obi-Wan Kenobi thought that Darth Maul was from Iridonia (though I don’t know why) and Yoda and Mace Windu both know that there are more from his species and that there are some of his species on Dathomir, despite it being “the planet of the witches”. 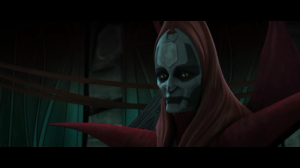 Mother Talzin in response to Savage Oppress: “Not all of them,” while image of Darth Maul shows in her crystal ball. This revelation that Darth Maul is still alive is tremendously incredible! When I first watched this, I could not believe what I was watching! Darth Maul was clearly sliced in half and surely fell to his certain death – how could he be alive?!? I was very upset when I saw this episode and reveal, because he was surely dead – why would they pull a stunt like this? !